YRTW SOL 5 and 6 – Gamma Radiation Report – mapped! “In a short time a dose of 1 Sv causes acute radiation sickness, and a dose of 10 Sv is fatal.” Short and to the point, the Sievert measurement informs all residents of imminent danger. Very democratic, that. YRTW SOL is published every two weeks on Saturday. The next publication dates are March 11, 2017 and March 25, 2017. ” … In a short time a dose of 1 Sv causes acute radiation sickness, and a dose of 10 Sv is fatal.” Short and to the point, the Sievert measurement is meant to inform all residents of eminent danger. YRTW SOL will always report Sieverts when available in the future in the States. In addition, Japan and the European Union report radiation measurements in Sieverts. Listed in Counts per Minute, a Count is one Radioactive Decay Registered by the Instrument. CPM is also used by the EPA (Environmental Protection Agency,) to measure ionizing, deadly radiation. This blog is a public service message to the Unsuspecting Public, brought to you with goodwill via Lucy Occupy and Friends, in compliance with copyright permissions. Lucy found a Pin for you! 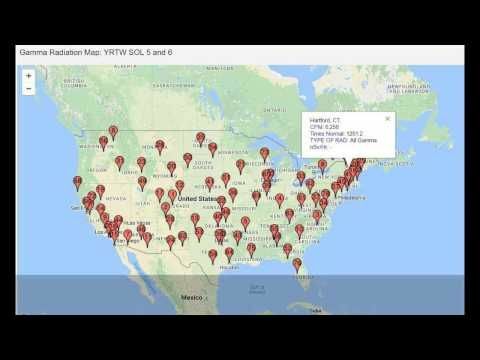 Gamma Radiation Report: YRTW SOL – Mapped! WATCH IT!